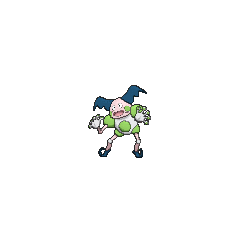 MrMime in game: 704 Who? Important notice! 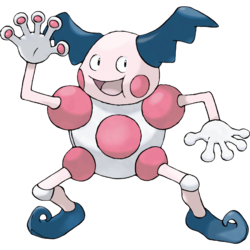 Pokemon MrMime is a fictional character of humans. Mr. Mime is a bipedal, humanoid Pokémon with a round, white body with a magenta spot in the middle. 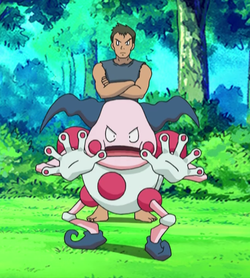 Its light pink arms and legs are connected to its body by magenta spheres. Its knees have small, white coverings. There are magenta pads on the tips of its white fingers, and its dark blue feet curl upward at the tips. Blue growths resembling clown hair extend from the sides of its pale pink head, and there are magenta circles on its cheeks. Its jaw is curved inward, resembling the mouth of a wooden dummy. From birth, this Pokémon is an excellent pantomime. As it matures, it gains the ability to solidify air molecules by vibrating its fingertips. This ability allows it to compose invisible objects with its gestures. It punishes those who interrupt its act by slapping them. Mr. Mime is usually very rare, but can be found in suburban areas. Mr. Mime's first anime appearance was in It's Mr. Mime Time. Ash and his friends were looking for a Mr. Mime to replace another one that was supposed to perform in Stella's circus. Ash originally dressed as one to encourage the old Mr. Mime, soon confusing his mother when a wild Mr. Mime arrived at her house. Stella had her own, lazy Mr. Mime in It's Mr. Mime Time which had quit obeying her because she was too hard on it. It listened to her once more once it saw how she was willing to protect it from Team Rocket. In Stage Fight!, a Mr. 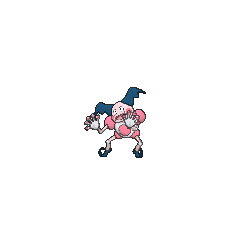 Mime was part of a showboat stage show along with other Pokémon. A Mr. 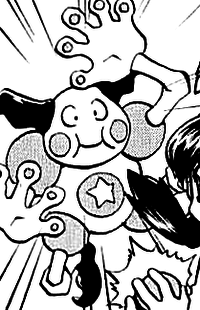 Mime was one of the Pokémon living in Len Town under the ownership of Toku in The Psychic Sidekicks!. Mr. Mime also appears in Hail to the Chef under the ownership of Rhonda, a girl who lives outside Saffron City who was competing with her sister, who owned a Sneasel, for the ownership of her father's restaurant. Another one appeared in Short and To the Punch! under the ownership of Clayton. It battled Ash's Buizel twice, beating it the first time but losing the second due to Buizel's Ice Punch. Mr. Mime first appeared in Pikachu's Vacation in a Pokémon park. An image of a Mr. Mime appeared in Hocus Pokémon. Another one appeared in Historical Mystery Tour! under the ownership of a Clown. DP159 Mr. Mime Dawn's Pokédex Mr. Mime, the Barrier Pokémon. By rapidly moving its fingers, Mr. Mime can stop air molecules to compose an invisible wall. Mr. Mime was first seen under the control of Sabrina in Peace of Mime, generating a Light Screen to seal off the whole of Saffron City. The same Mr. 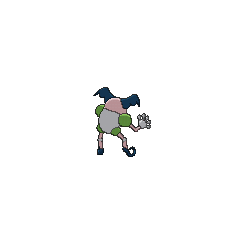 Mime was seen again during the Gym Leader faceoff in the Indigo Plateau, using its miming powers to trap Bugsy within walls breed from solidified air, and defeating his Heracross with a Psybeam. Crystal was revealed to have added a Mr. Mime, nicknamed Mymee, to her team during the Emerald chapter in order to imitate Sabrina's tactics. Valerie owns a Mr. 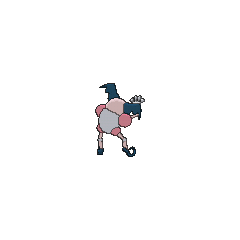 Mime in the X & Y chapter, where it was used to help stop the Ultimate weapon from activating. Bryony's familiarity with the tactic used by Valerie's Mr. Mime, by means of referring to pages from an encyclopedia, is a direct reference to the two occasions the tactic was previously used in Pokémon Adventures. Pokémon Mystery Dungeon: Explorers of Time, Darkness & Sky: During the post-game, after graduating, a few days later, Mr. 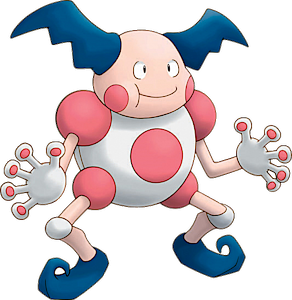 Mime will appear in Treasure Town, saying that a famous Scizor has been trapped in a dungeon called Blizzard Island. After, Mr. Mime will remain in Treasure Town. In Sky, it also appears before the post-game as a regular visitor of Spinda's Cafe. A skilled mime from birth, it gains the ability to compose invisible objects as it matures. Its fingertips emit a peculiar force field that hardens air to compose an actual wall. It is adept at conning people. It is said to be able to compose walls out of thin air by miming. It is a pantomime expert that can compose invisible but solid walls using miming gestures. Mr. Mime is mime with an English male honorific. The assignment of a gendered title has no bearing of its equal male/female gender ratio, as it was named before the gender mechanic was introduced in the games.